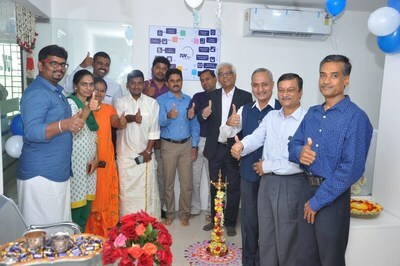 TUV India Private Limited (TUV NORD Group), a leading Inspection, Certification and Testing organization, inaugurated its branch office at Officer's Colony Puthur, Trichy on 31st Oct 2018. The branch office is well equipped with modern amenities to provide outstanding work environment for employees. Mr. R. Suresh, Incharge- Inspection Services, Trichy welcomed Mr. Shrikant Kulkarni, Senior Vice President, Certification, Training and Sustainability, along with TUV India team members from Chennai and Coimbatore branches for the inaugural ceremony. On this occasion, Mr. Manish Bhuptani, Managing Director, TUV India Private Limited, sent best wishes to the team and said, "Our rapid growth is encouraging us to further open new offices across the country and opening of Trichy branch is aligned to our strategic expansion plan." TUV India Pvt. Ltd. part of TÃœV NORD GROUP was established in 1989 - as part of the German RWTÃœV group's Indian operations. With over 12,000 satisfied customers and over 750 employees in more than 25 locations and state-of-the-art laboratories across India, TUV India is never far from its customers. TUV India Pvt. Ltd. provides diverse services in Inspection Services, Management Systems Certification, Infrastructure, Roads & Highways, Petroleum, Chemicals & Gas Services, Laboratory Testing, Training, Automotive Services, Product Testing and Certification, Sustainability Services and Renewable Energy.